Effective SEO for dentists is the cornerstone of any digital marketing strategy. The right SEO techniques has many benefits including increased internet exposure, increased brand awareness, even more phone calls and appointments. Optimizing your website for search engines will put your business on the top of the first page for keywords that can be vital to your success. Before there were search engines a large part of the market would go to local listing directories to find their local dentist and give them a call, but those days are over. Almost every consumer now reaches in their pocket to grab their phone and do a search when they look for any product or service. It’s convenient, fast, easy and it’s definitely not going away. If a large part of the market is searching for services online, if you want your business to be found by those searching you have to be optimized for search engines. How will your clients find you if your website is hard to find? In this post we will go over the definition and value of SEO, our fundamental SEO strategy and how you can get started. Search Engine Optimization is the process of ranking a website higher on google with the intent of getting a business more internet exposure, more phone calls and most importantly more sales. Why Is SEO For Dentists Important? SEO for dentists is extremely valuable because it enables a dentists’ office to be visible on search engines when their potential client is looking for their service. SEO is a highly targeted marketing strategy because you can optimize your website for search terms that your ideal client would type into google. 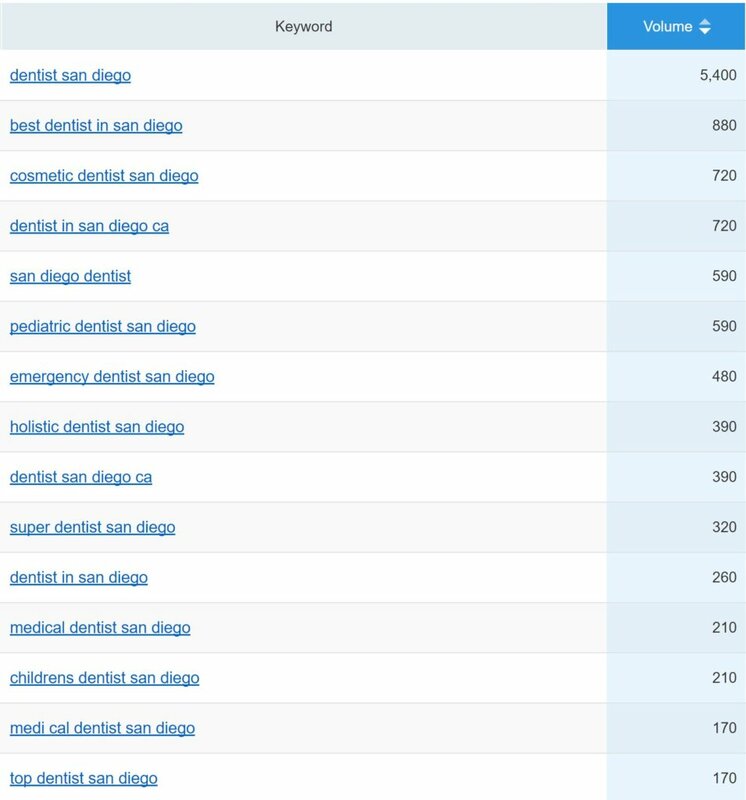 In the image below notice that the search volume for the keyword “Dentist San Diego” is 5,400. That means that there are 5,400 people looking for a dentist in San Diego every month! That’s a lot of people. Now keep in mind that 92% of the search volume clicks on websites that show up on the first page of search engines. So if you are on any page other than the first page the chances on anyone clicking on your website are very low. If you can get your website on the first page for your “local city + dentist” I can guarantee that you will get an increased number of phone calls, appointments and sales. Being able to rank on the first page of search engines helps your business get more clients in the beginning of the sales cycle, awareness. When someone is searching for a dentist in your local city and your website shows up on the first page that consumer is now familiar with your dental practice and the chances of them purchasing from you business have just increased. In order to deliver effective SEO for dentists, a certain skill set is required. Some of the most important skills required to optimize a website include both technical and people skills. The right SEO agency will begin by going through an in depth audit of your website to determine where your website currently stands. They will fix any and all on page issues and create an overall strategy for your website. I’ll go over the most important aspects of any sound SEO strategy and what we do to ensure your website ranks on search engines. After the website has been analyzed for any on page issues, keyword research begins. The root of effective SEO starts with the right keyword research. We look for keywords that your ideal client would type into search engines when they are looking for your service. It’s our job to determine which keywords show clear buyer intent. Keywords often include a service and a specific city. An example is Dentist San Diego, and modifications as well such as: Best Dentist San Diego, Medi cal Dentist San Diego. The image below has a quick sample of keywords a dentist could benefit from. Recently, search engines have been using the location of the search query to refine the results and deliver the most relevant websites depending on the location that the search is being initiated. So if some one searches the keyword dentist, and the searcher is in San Diego, search engines will deliver the results that would normally show up for Dentist San Diego. So ranking your website for Dentist + your local city, you will see traffic for search queries as short as “Dentist” for search queries in your geographic area. Aside from on page optimization, obtaining relevant, and authoritative, links is the second most important ranking factor. Search engines see links like a popularity contest. The websites that have the most links, holding everything else equal, will rank higher on google for relevant searches. You can think of a link as a vote. When someone links to your site they are recommending, or voting, for your website. The more votes (links) you get, the higher the chances you have of winning. We always make sure to include a solid link strategy to make sure we are consistently obtaining relevant and authoritative links for your website so we can help it beat the competition.